A video of U.S President, Donald Trump vowing his government will protect Christianity has gone viral surfaced the internet. The video recorded before he became president sees him saying he is a proud Presbyterian and thinks the religion is under siege. 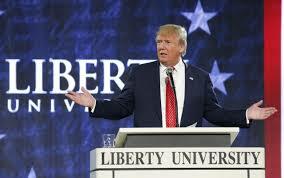 He also said at the Liberty University last year, that Christianity will be protected because “very bad things are happening and called on Christians to unite around the world. "We are going to protect Christianity and I can say that.I don't have to be politically correct “If you look what's going on through out the world. If you are a Christian in Syria, they chop off your head” Trump said Christianity is under siege. I am very proud of my religion and we have to protect because our religion is under siege.We have to unify and band together.